Our We Try Before You Buy series aims to take the stress out of shopping, and at this time of year, the thing that requires the most thought is wedding guest dress shopping. If you're spending £200 something on a special dress, you don't just want to wear it for only one day. So I asked the Who What Wear team to show me how they'd wear a dress for a wedding and then on an ordinary day too. Keep scrolling to see how you can make even the most special evening dresses daytime-appropriate too. On Alyss: Topshop Denim Jacket; Topshop Spot Floral Bead Maxi Dress (£65); Converse sneakers. 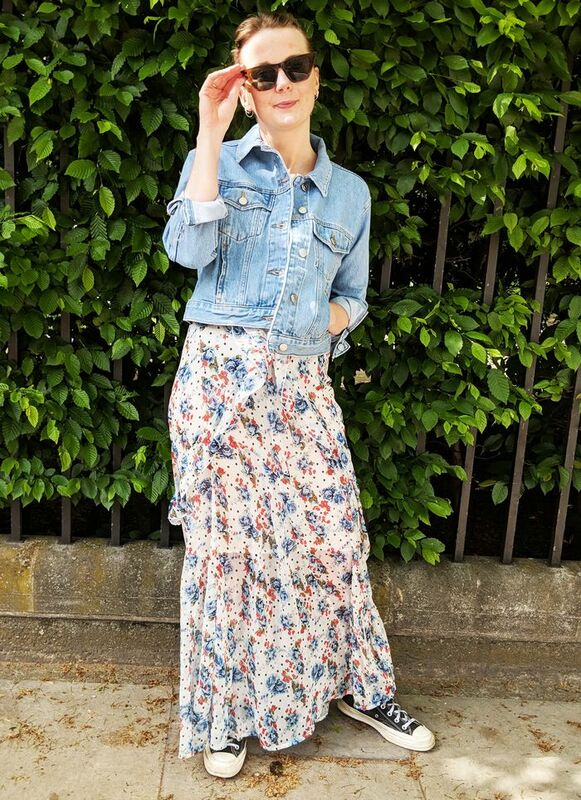 For the day: Alyss made her floral Topshop maxi dress look casual by pairing it with her Converse and a cropped denim jacket with the rolled-up cuffs. On Alyss: Topshop Spot Floral Bead Maxi Dress (£65), Strappy Sandals (£46) and Amelia Mini Cross Body Bag (£75). For the wedding: Alyss made her dress more wedding appropriate by wearing a pearl hair clip in her hair, strappy black heel sandals (with a mini dancefloor-friendly heel) and a pink handbag. On Isabel: Rixo Laura Polka-Dot Crepe Mini Dress (£235); Mango Heels. For the day: Isabel's spotted short Rixo dress is perfect for work in the summer, paired with white Mango low block heels, a vintage black tote bag and square sunglasses. On Isabel: Rixo Laura Polka-Dot Crepe Mini Dress (£235); Zara sandals; Vintage bag. For the wedding: Isabel transformed her spotty number by pairing it with gold Zara strappy sandals, a black beaded mini clutch, gold hoop earrings and a pearl slide in her hair. And not forgetting the red lipstick of course. On Emma: Ganni Joycedale Printed Silk Shirt Dress (£430); ATP Sandals; Meli Melo Bag; Topshop Dree Jeans; Kite Sunglasses. For the day: This Ganni dress is perfect for wearing with jeans, and Emma wore hers unbuttoned with her Topshop Drees, a white T-shirt, a Meli Melo tan bag and ATP Atelier leather sliders. On Emma: Ganni Joycedale Printed Silk Shirt Dress (£430); Dune Red High Heels. For the wedding: Emma's silk Ganni shirtdress can feel a little casual with flats, so to make it ready for a formal celebration, she paired it with the highest red heels she owns by Aldo. On Luisa: Iris and Ink Noel Asymmetric Satin-Twill Midi Wrap Dress (£195); Topshop Kale Trim Mule (£46); Joseph Draycott Sunglasses (£235). For the day: Luisa tied her Iris and Ink wrap dress with a knot at the front layered over skinny jeans and a white slogan T-shirt. On Luisa: Iris and Ink Noel Asymmetric Satin-Twill Midi Wrap Dress (£195); ASOS Sandals; Nannacay Bag. 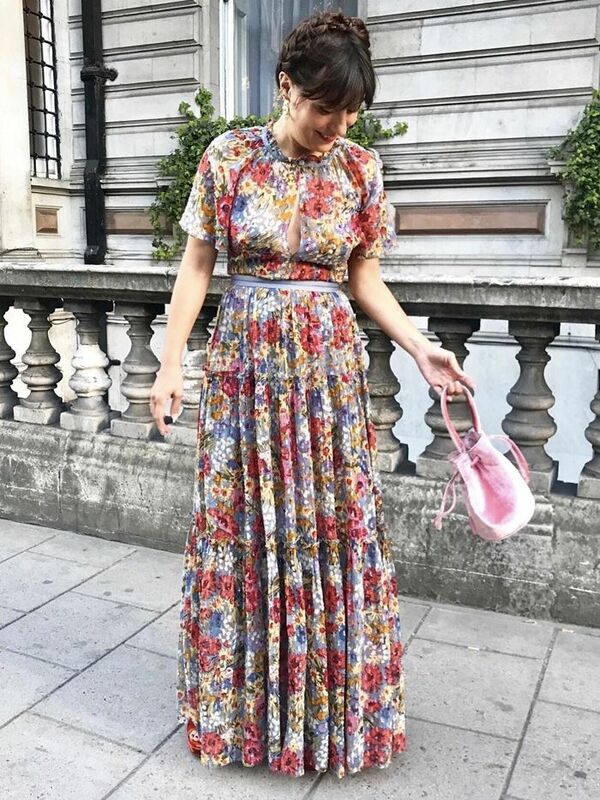 For the wedding: Luisa had fun with her accessories, pairing her satin wrap dress with a cute red mini basket bag from Nannacay and a pair of lace-up sandals from ASOS. On Hannah: De La Vali Juliette Polka-Dot Silk Maxi Dress (£625); Mango Hat; Carvela Koo Shoes (£99). For the day: Hannah made her polka-dot gown holiday-ready by tying it to one side to turn it into a midi dress, and pairing it with her Mango sunhat and string beach bag. On Hannah: De La Vali Juliette Polka-Dot Silk Maxi Dress (£625); Vintage bag and belt. For the wedding: Hannah upped the glamour with this dress by wearing it with a gold statement circle chain belt and a vintage beaded handbag.